The mission of the Avery Research Center is to collect, preserve, and promote the unique history and culture of the African diaspora, with an emphasis on Charleston, the South Carolina Lowcountry, and beyond. Avery’s archival collections, museum exhibitions, and public programming reflect these diverse populations as well as the wider African Diaspora. 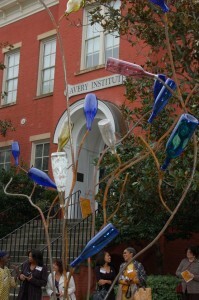 The Avery Research Center is located at 125 Bull Street, Charleston, SC 29424 in the historic Harleston Village. Phone: 843.953.7609. General hours of operation are Monday–Friday from 10:00 a.m. to 5:00 p.m., and closed from 12:30 p.m. to 1:30 p.m. daily. (APRIL 2019): THE AVERY RESEARCH CENTER CONTINUES TO BE CLOSED TO THE PUBLIC. NO ON-SITE TOURS OR ARCHIVAL ACCESS WILL BE PROVIDED. THE AVERY RESEARCH CENTER HOPES TO REOPEN LATER THIS YEAR. VISIT THIS PAGE OFTEN FOR UPDATED INFORMATION. THANK YOU VERY MUCH FOR YOUR PATIENCE! THE AVERY RESEARCH CENTER IS CLOSED TO THE PUBLIC AT THIS TIME. Though the Avery Research Center is currently closed due to renovations, donations are still welcomed.